The Eastwood MIG Stud Welding Kit transforms your MIG welder into a Stud Welder. With this kit you will be able to repair and remove dents from sheet metal. It includes everything you will need to start repairing dents with your MIG welder. The kit includes MIG Stud Nozzle, Slide Hammer, and 100 2mm Pins. The nozzle included in this kit was designed to work with Tweco style nozzles and may or may not work with other style MIG torches. The Eastwood MIG Stud Welding Kit transforms your MIG welder into a Stud Welder which can be used to repair and remove dents from sheet metal. 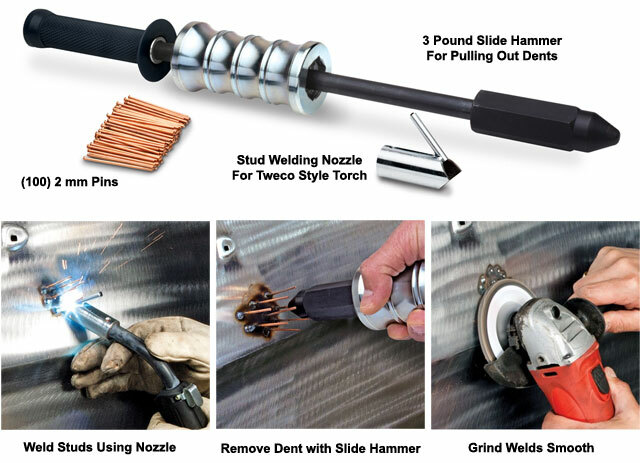 This kit includes everything you will need to start repairing dents with your MIG welder. The kit includes MIG Stud Nozzle Slide Hammer 100 2mm Pins. The nozzle included in this kit was designed to work with Tweco style nozzles and may or may not work with other style MIG torches.